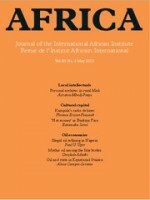 Éditeur / Institution: Africa: The Journal of the International African Institute, 2013. CAMPOS SERRANO, Alicia, « Extraction Offshore, Politics Inshore, and the Role of the State in Equatorial Guinea » en Africa: The Journal of the International African Institute, vol. 83, nº 2, 2013, pp. 314-339.